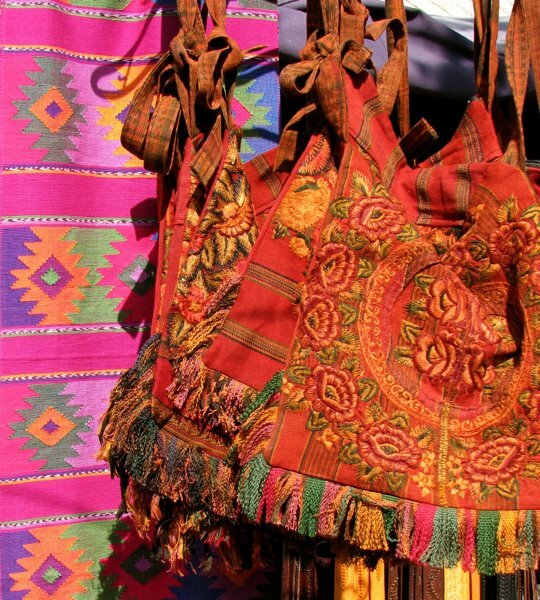 At the Ajijic tianguis, the unusual is the norm. 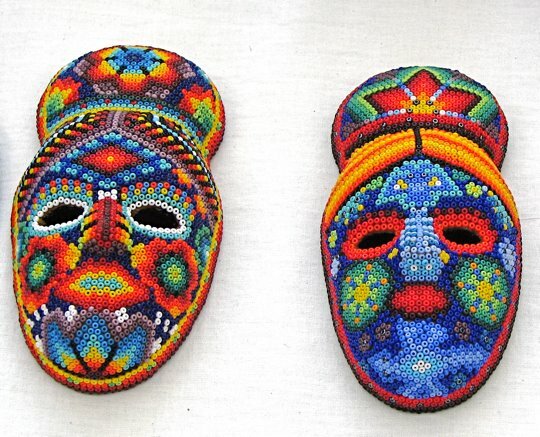 Huichol Indians use tiny beads to make masks and other decorative objects to sell at the tianguis. 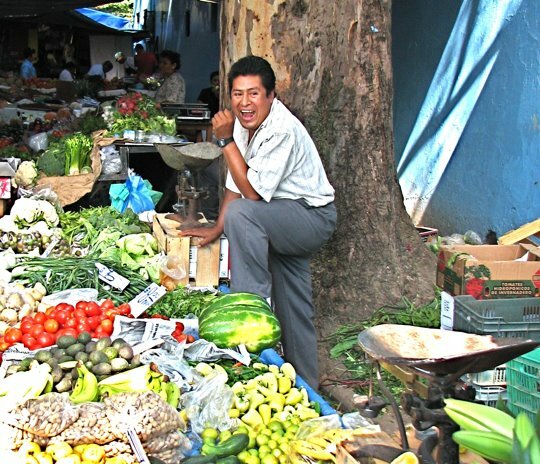 In the Nahuatl language used by the Aztecs, tianguis means "market place". 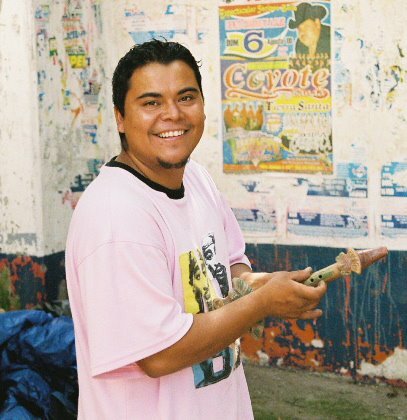 Tianguis, pronounced tee-ahn-gees, are held all over Mexico and have been since long before the Spanish arrived. You can buy an incredible variety of goods at one of these street markets. Everything is available from folk art to flashlight batteries to fresh fruits, and often you can bargain for a lower price than the one requested. A serenade for a pretty gringa. The Ajijic tianguis is an entertainment in itself, even without a purchase. With their spirited music, the two street musicians amused the gringa above as well as other passersby. 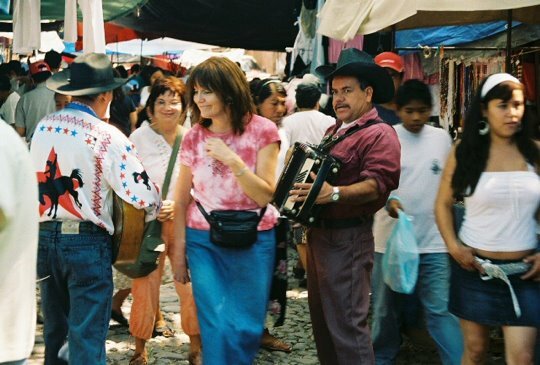 In Ajijic, the tianguis is held every Wednesday from about 10 AM to about 2 PM along Calle Revolution from where it meets the Carretera down about two blocks to Calle Constitución. I like going in the cool morning hours between 10 AM and noon when it is a little less crowded. Those looking for bargains may want to wait until shortly before the booth operators begin to pack up in the afternoon and are amenable to a quick sale. Your work of art created as you watch. 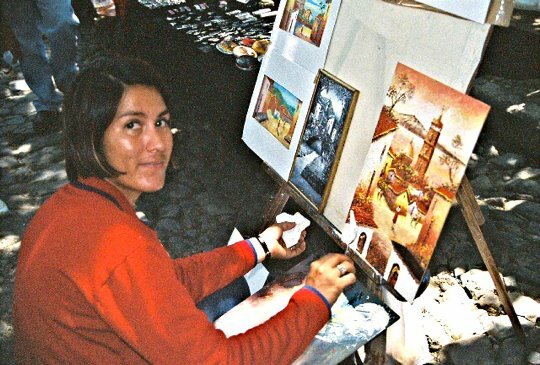 There are usually several artists working on their creations while they wait for a sale. This young woman uses a small trowel instead of a brush. Not great art, but original, fun and evocative. She sells paintings like the one above for a very reasonable price. Death on a burro. The Mexican attitude toward death is often humorous, unlike the typical whispered dread found north of the border. 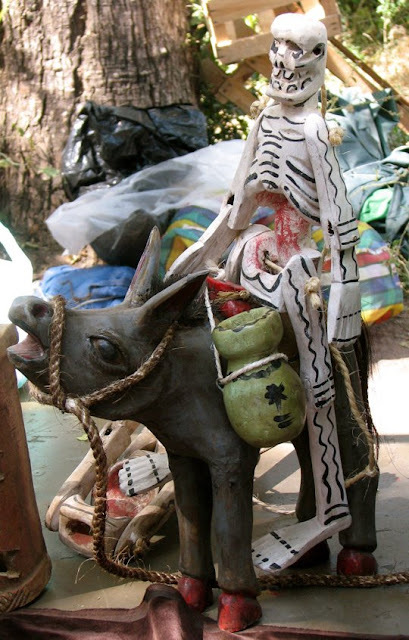 Above, a rather tipsy skeleton (we would call him borracho) straddles a braying donkey. This hand-carved little piece is just the thing for that friend who likes to "tip a few" a bit too often. Or, if you live in Mexico like me, a great little decoration for the Dia de los Muertos (Day of the Dead). Quite a number of booths are dedicated to jewelry. Some of the stones are sold unset, and others come in necklaces, bracelets, rings, and pendants. The stones may include onyx, fire opal, amthest, jade, amber, turquoise and any number of other semi-precious stones. The settings are often in silver which has always been plentiful in Mexico. 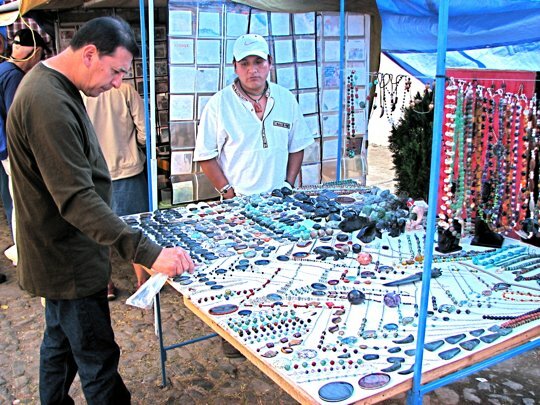 There are numerous jewelry crafts people in town, as well as those who visit just for the tianguis. Ceramic masks hang in rows or cover a blanket on the ground. 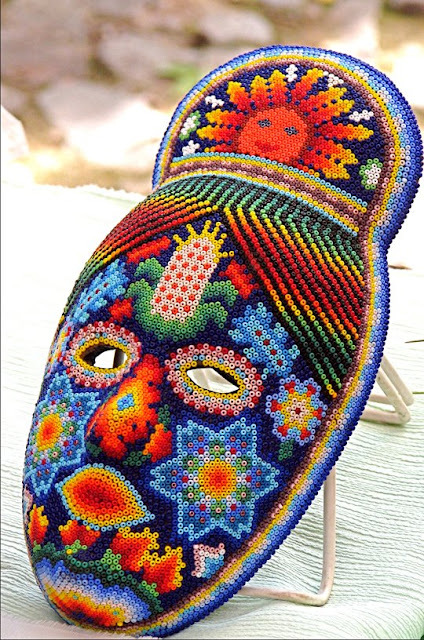 Masks are found in nearly every society, but have special meaning in Mexico. The ones above were created for purely decorative purposes, but many masks are still made for Indian ceremonies and nominally Catholic fiestas. 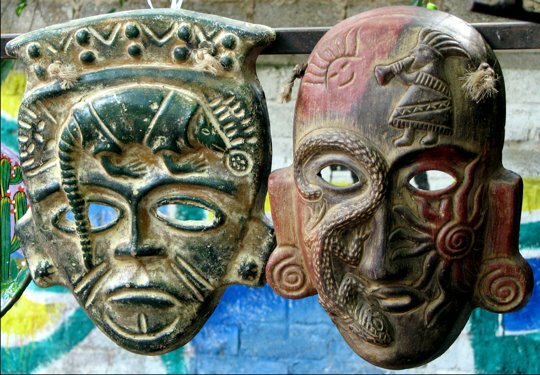 The earliest known masks from pre-hispanic times date back 3,500 years. After the Spanish arrived, masks were often used in ceremonies and plays to present Christian stories so that the Indians could be weaned away from their native religions and indoctrinated with Catholicism. Cleaning nopal takes a deft touch to avoid the spines. These woman make it look easy, but novices usually end up with a hand full of maddeningly tiny spines. 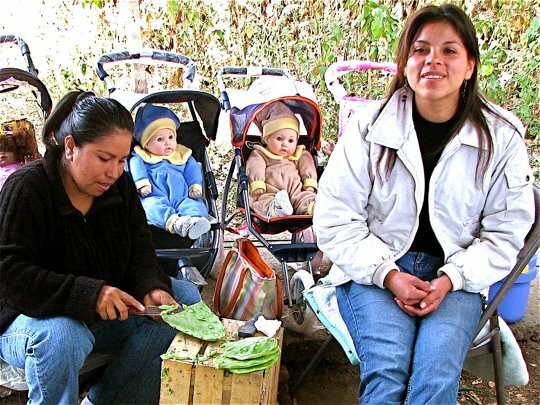 The occupants of this booth sold not only fresh nopal, but doll babies in carriages. This follows the typically odd juxtaposition of sales goods found in the tianguis as well as in neighborhood stores called tiendas. Nopal comes from the cactus plant often called "prickly pear". The flat paddles are harvested from a live plant, scraped of their spines, then either sold as is or cut up in strips. I have occasionally sampled nopal fresh off the plant on my various hikes in the mountains. It is deliciously crisp, with a slightly tart taste. There are also various tasty recipes for cooking nopal. Carole uses it as a side dish, or in vegetable soups. Nopal is also very nutritious and good for conditions like high cholesterol. There is evidence that humans have been harvesting nopal for at least 12,000 years. A tempting treat, but one deserving caution. 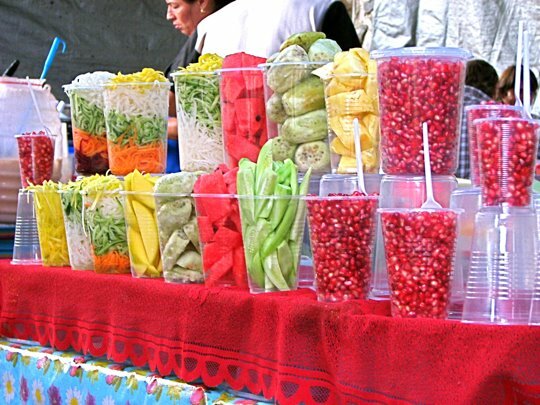 Cups of various freshly cut fruits can be purchased at the tianguis. These look delicious and probably taste great too. I have been pretty cautious about sampling, because there are no handwashing facilities at the tianguis, and one can catch a good dose of the "turista" from foods like this. The germs that cause turista, known north of the border as Montezuma's Revenge, are easily passed through handling money. As an aside, Mexicans who travel to the US and Canada often get turista there, and sometimes resent the term Montezma's Revenge as a slur on Mexico. I use the term here only for purposes of recognition. Desculpe to my Mexican friends. Colorful textiles are everywhere in the street market. Woven rugs and embroidered purses are especially nice, and often quite inexpensive. Carole has purchased a number of hand- embroidered pillow covers for about $9.00 USD each. The girl who operates the booth told us that she and her family make them. One caution: they are not necessarily color-fast, so watch out when washing them. A young flute-maker prepares to try out his creation. This young man rewarded me with a warm smile when I asked to take his picture with his carved wooden instrument. Very likely, I will hear one of his creations played by one of the numerous street musicians around Ajijic. 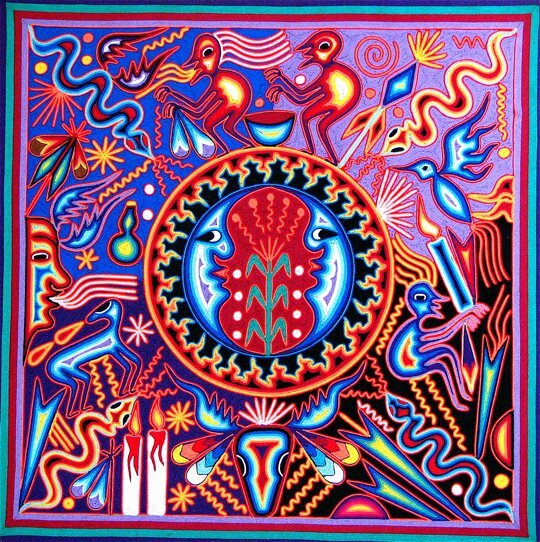 Huichol Indian art is exquisite and full of mystical meaning. Usually there are several tables operated by Huichols selling beaded items from large-size jaguar heads to small bracelets. The amount of careful work that goes into even relatively small-sized masks such as those above is daunting. This may be why I have found few Huichols willing to reduce their asking price for their work. One time I watched a Huichol craftsman at work on a full-sized representation of a jaguar. When I asked him how long it takes to finish a work like that, he thought about it a moment and then simply said "until I am done". Huichols also use colored thread on flat boards. This panel is about 18 inches (45.7 cm) on a side. On a similar creation, one of my friends actually counted the stitches in a 2 inch by 2 inch section and calculated that the whole square had more than 60,000 stitches. Typically included on one of these panels are symbolic representations of the plants and animals found in the Huichol's natural world. Peyote, found in the desert, is a key part of the Huichol religious expression. As one woman said "Peyote opens our hearts so that we can see with our hearts". There are about 18,000 Huichols left, mostly concentrated in remote areas of Jalisco and Nayarit States. The ones we see at the tianguis and around the Lake have come to sell their creations, or perhaps have been dispossessed from their lands back home. They are instantly recognizable by their wonderfully embroidered clothing and the hats that the men wear. Very few Huichols will allow their picture to be taken. They are a shy, but very proud people. 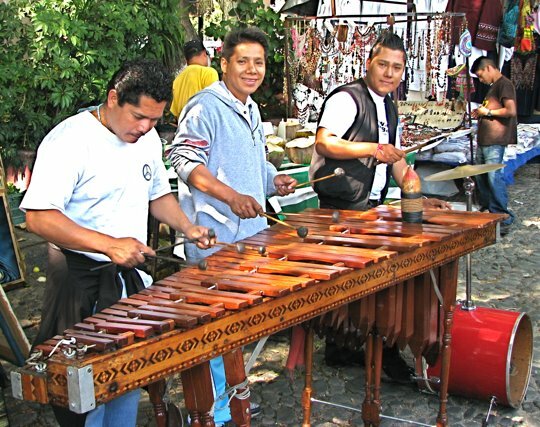 Marimba bands are usually found in or around the tianguis. What distinguishes Mexican marimbas are the multiple players one finds behind the instrument. The polished and lacquered instrument itself is a thing of beauty. There is usually one person with an accompanying instrument that is rhythmically scraped, but which is also shaped like a flour scoop and doubles nicely for tip collections. Marimbas are especially popular in the southern states of Mexico, and some claim that the Maya had a hand in its invention. However, it is most likely an import from Africa, brought over by slaves put to work by the Spanish. I usually tip the bands generously because they provide such a wonderful atmosphere, and the life of street musicians is hard. 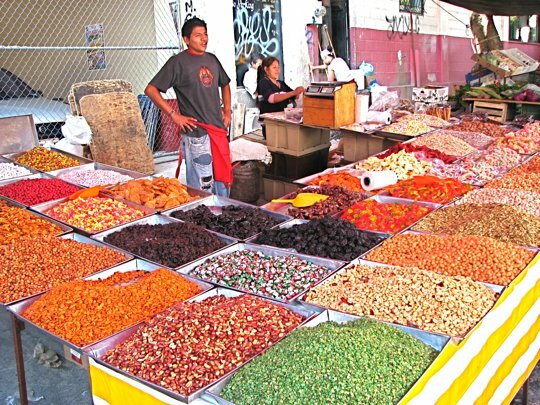 Beans, corn, nuts, dried fruits and more! My eye was attracted to the vivid colors of the mounded products in these bins. Corn, beans, and squash have been grown by native people in Mexico for about 6000 years. The method originated by the ancients is still used today in small milpas (family fields) that I have seen in the mountains and backcountry around Lake Chapala. The corn and beans are planted together. The beans use the corn stalk as a stable climbing platform. In turn, the nitrogen-loving corn gains from the beans which have an unusual ability to draw nitrogen from the air and put it into the soil. Squash is planted between the mounds containing the corn and bean plants. The long vines of the squash cover the ground and keep weeds down. Unfortunately, the North American Free Trade Agreement (NAFTA) has allowed US corporate agribusinesses to dump large amounts of these industrially-created products in Mexico. This has driven thousands of small farmers from the land. The farmers then head across the border to find some way to support their families by working in the fields of US agribusiness or cleaning their corporate offices, among other things. How much is that puppy in the milk crate? One can usually find puppies for sale. These two look almost identical to many others I have seen roaming the streets of Ajijic. As a dog lover, I have very mixed feelings about this. Very few dogs in Mexico are neutered, either those with families or strays. Consequently there are legions of dogs throughout the town. However, the fact that they roam freely means that they are far better socialized than dogs I have encountered north of the border. I have seen few dog fights, and whether stray or owned by a family, they are unusually friendly with strangers. I have begun to believe the level of confinement of US dogs, and the degree or irregularity of their encounters with other dogs or people, drives them a little nuts. The Gringos in town have started several animal shelters and somewhat reduced the numbers of strays, but these efforts are always scrambling for donations. One such outfit, Anita's Animals, regularly sells used books in the tianguis to raise funds. 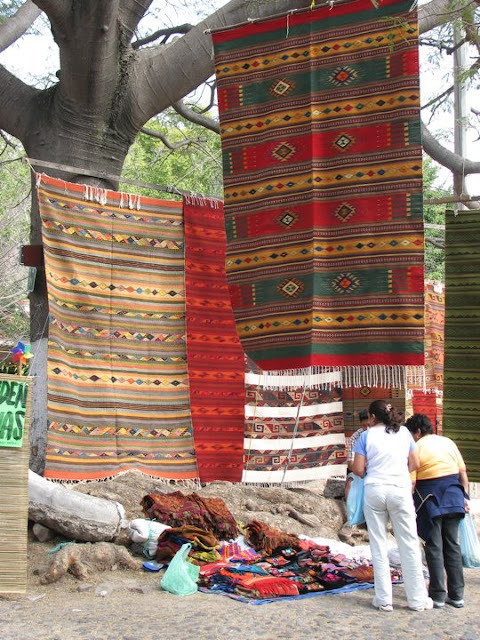 Rugs from Oaxaca hang from trees near the tianguis' entrance. Wonderful rugs are woven all over Mexico, but those from Oaxaca State are particularly prized. Typically, these rugs are strung up from handy branches along the Carretera near the Calle Revolution entrance to the tianguis. The Indians of Oaxaca are known as Zapotecs and had a high level of culture at the time of the Spanish Conquest. In fact, Zapotecs were weaving cotton textiles as far back as 500 BC. After the Conquest, Franciscan Friars introduced Merino sheep, which have long-fibred coats ideal for weaving. The Zapotecs rapidly adapted to this new resource and their colorful rugs are found everywhere. Carole and I got lucky and found a beautiful 8 foot x 4 foot rug at a garage sale for only $10.00 USD. Those pictured would sell for much more than that, and would be well worth it. Bottom line, the tianguis is just a lot of fun. A vegetable vendor above enjoys a laugh with a friend while waiting for a sale. Notice the old-fashioned scoop-style scales on either side of him. There are no regular electrical outlets available, but the old way works just fine. The vendors are always ready with a quip or a smile, particularly for those customers they recognize. Expats here often comment how much better the produce at the tianguis looks and tastes than that bought in a supermarket. Generally it comes from small plots and fields worked by the vendor, or a family member or friend and may have been harvested as recently as that morning. This completes my posting on Ajijic's tianguis. It is definitely should be a "must-visit" for your relatives or friends from out of town, or for yourself if you have never been. And if you are visiting some other part of Mexico, ask around for the tianguis in your area. I guarantee you'll have a lot of fun.